Transformative urban politics. How can we? 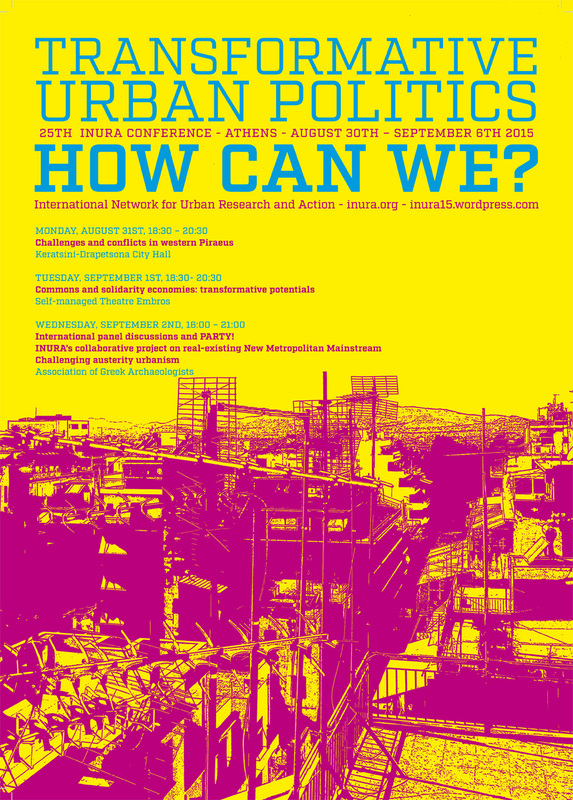 Δημοσιεύθηκε: 30/08/2015 | Συντάκτης: encounterathens | Filed under: English, Είδαμε/Διαβάσαμε | Δεν επιτρέπεται σχολιασμός στο Transformative urban politics. How can we? The 25th INURA conference returns to Athens 7 seven years after it tried to reflect on “Non/De/Re-regulation” and while the city has been at the whirlwind of glocal crises. As a consequence of the unsolved crisis and anti-social austerity measurements the housing situation of many Europeans has extremely worsened during the past five years. This is the reason why, before the coming elections to the European Parliament and to many local councils, housing grass-root groups of the “European Action Coalition for the Right to Housing and to the City” are joining protests for a democratic and social transformation of the European structures and for a rights based approach in urban development. We urgently need an immediate stop of forced evictions which are the result of financial speculation and economic collapses. And we need a general shift from the rule of financialized real estate markets to social housing policies. Below, we want to highlight two of the national protests.